Strong magnetic anomalies occur at the entrance to each one measured. 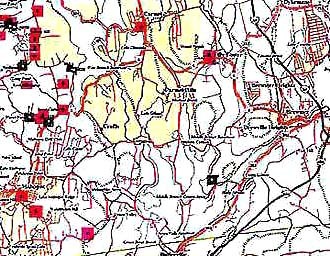 When the first English settlers came to New England they discovered numerous well-made stone cellars or chambers in Putnam and Dutchess counties. The builders of these chambers are unknown, although some archaeologists suspect the Druids. Only recently was a hand knife found under a rock in one of the chambers. It had a shape and designs on the handle that implicate the Druids. At last word, Phil Imbrogno has possession of that artifact. 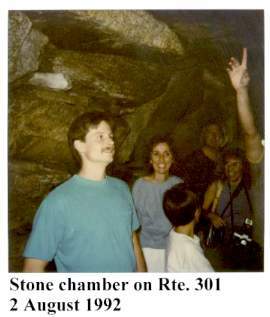 On 2 August 1992 Imbrogno took a group of a dozen people on a field trip to see some of the stone chambers. Cornet was among them. He took along a Precession Proton Magnetometer, because of reported magnetic anomalies associated with some of the chambers. He wanted to map the anomalies, if possible, to determine the cause. What he did not expect was to find the answer so easily. And yet, because he did not have official sanction from the landowners or local archaeologists, he could not dig to confirm his suspicions. 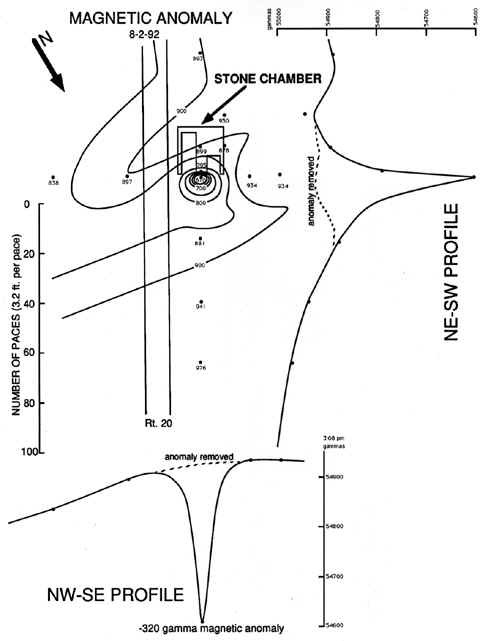 This web page presents the data he collected in the form of maps, which show the anomalies as clearly residing at the entrance way to three chambers he measured. 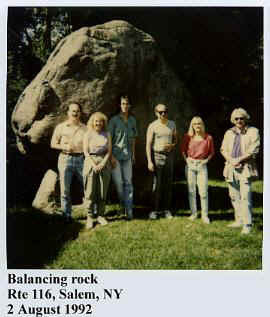 In addition, he measured a magnetic anomaly at the Balancing Rock in North Salem, New York. 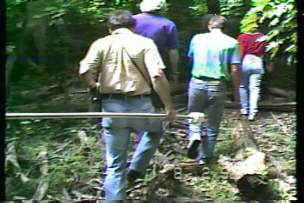 Pictures from a video taken during the field trip are provided below. 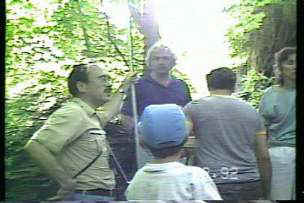 Upper left: Phil Imbrogno, field trip leader. 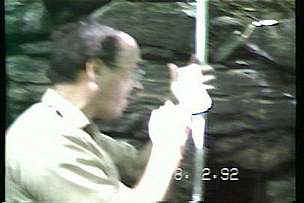 Bruce Cornet with magnetometer in other pictures. 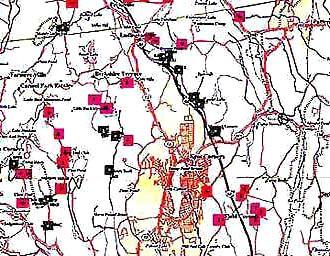 Paul Armbruster of Carmel, NY, produced a map in 1994 showing all the stone chambers he had located in Putnam and Dutchess counties. The red rectangles indicate the chambers Armbruster has visited and checked out (confirmed). Click on each quadrant for an enlargement. Magnetic anomaly situated between the two chambers where Ellen Crystall is standing (above). 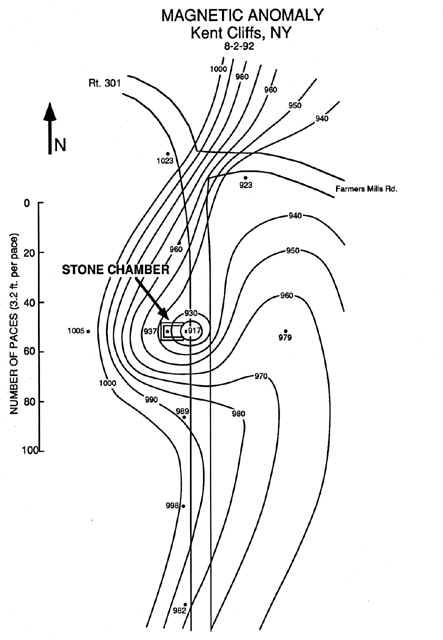 Magnetic anomaly at entrance to large chamber at top of hill (no pictures). The smaller chamber nearby did not seem to have a magnetic anomaly at its entrance. Boulder is propped up by three or four smaller stones. AD: Get 700-301 demos for Actualtests E20-597 and prince2 project management methodology with 100% success guaranteed. Our high quality 642-813 dumps prepares you well before appearing in the final exams of HP . Two stone chambers were investigated in detail, while the third was not due to lack of time. A Precession Proton Magnetometer was used to measure natural magnetic fields and induced artificial magnetic fields around the chambers. Measurements were in gammas, not gauss (i.e. one Maxwell per square centimeter). 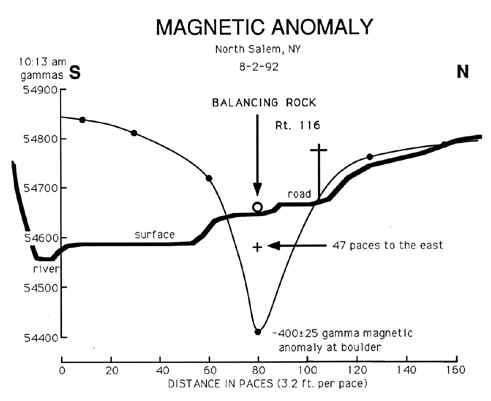 Normal background magnetism is usually between 54,800 gammas and 55,000 gammas. Cornet describes gamma fluctuation close to the double stone chamber (247K). 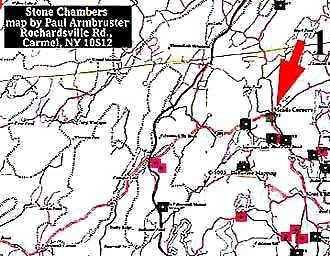 At the Meads Corners chamber and the Putnam Valley chamber significant magnetic anomalies were discovered at their entrances. 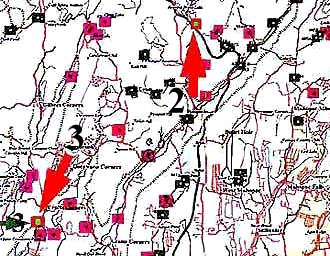 In the study of the Putnam Valley chamber and the Balancing Rock, the anomalies were so strong (320 and 400 gammas below background, respectively) that they reversed the needle on a compass. In other words, it was strong enough to counter the local Earth's magnetic field when the compass was held directly over the center of the anomaly. The magnetic anomaly at the Meads Corners chamber was not as strong. It was slightly less than 100 gammas below background. Map No. 1 does not show intense magnetic-line closure around the center of the anomaly. Instead, after two rings the magnetic lines become open to the northeast. 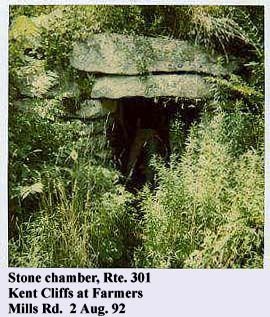 The road shoulder comes right up to the entrance of the chamber, and there is no stone slab located there as is the case at the other chambers studied. It is possible that during road construction or widening, the top of whatever is causing the anomaly was sheared off and deposited across the road. That might account for the lack of magnetic line closure and the direction of opening to the mapped anomaly. The magnetic anomalies are probably caused by a piece of carved loadstone, which was buried at the entrance to each chamber (or between the chambers when two of them were present side by side). 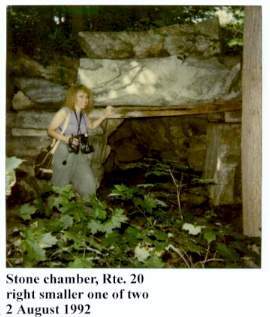 Excavation would have to be conducted to determine the actual cause of the anomalies, but that would require landowner permission, and possibly a permit from any state or county organization entrusted with protecting the stone chambers. It should be noted that the region contains a number of localities where iron-rich loadstone can be mined. Someone or some peoples went to a lot of effort to build so many stone chambers and to place a strong natural magnet at the entrance of perhaps most of them (not yet confirmed). The reason for putting a magnet there could be related to ancient religious or pagan rituals, which required the use of magic. 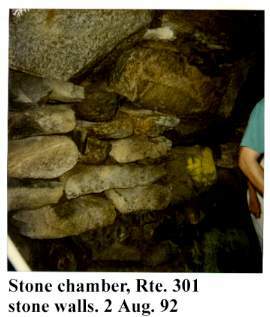 A strong magnet buried at the entrance to a stone chamber could have been placed there to ward off evil spirits, or to trick unsuspecting members of a tribe into believing that their shaman or priest had supernatural and/or godly powers. 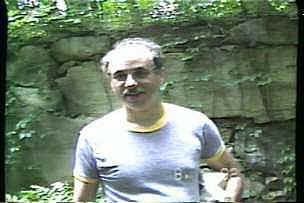 Powerful magnets may also have been placed there to help locate chambers in the forest or at night. The same reasons might apply to the Balancing Rock. 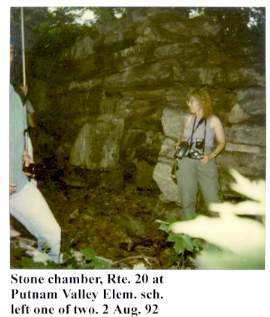 This study has confirmed that the stone chambers of Putnam and Dutchess counties do have unusual magnetic properties. The discovery of a center (source) for anomalous magnetism at the entrances of three chambers will hopefully create interest by other professionals to continue this research. By discovering the actual cause of the anomalies through excavation, additional artifacts might be found. Archaeologists, take notice.